Cara Fleming is a school psychologist at the high school level, as well as a transition consultant. What’s a transition consultant? I’m glad you asked. Transition consultants help kids successfully make the leap from high school to college and/or the workforce. Cara was great to interview. We laughed a fair amount, looked at things in new ways, and discovered some interesting things along the way. 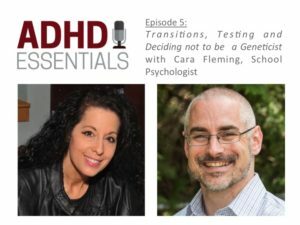 Cara talks transitions, testing, and shares why she isn’t a geneticist. Her knowledge and enthusiasm really shine through. I’m sure you’ll enjoy the show. Cara can help with questions around transition from high school, and also performs independent testing for families looking into Special Education diagnosis in the New England area. She can be contacted at [email protected]. As usual, I can be found at ADHDessentials.com. Or email me at [email protected]. P.S. This was the first episode I recorded for the podcast. I’ve learned some things since then, mostly on the technical end – editing & recording techniques. Still, I’m pretty happy with it. 18:31 But, what if my kid isn’t going to college!? !